LGBT Plus aims to empower lesbian, gay, bisexual, transgender, queer, intersex, non-binary, a-sexual and pansexuals as well as anyone affected by issues of sexuality, gender identity, or those who are questioning and expressing themselves. We believe that everyone has the right to feel safe, protected and involved. At LGBT Plus we support people to be able to engage confidently with their local community and become active citizens. Becoming a member gives you access to our member only events, voting rights and access to our monthly newsletter. To become a member you should complete the below form or alternatively you can also email info@lgbtplus.org.uk requesting more information. If you wish to provide any more information about yourself please add it here. You can also contact LGBT Plus via Tel: 0800 020 9653 (free from landlines), alternatively you can also email info@lgbtplus.org.uk requesting more information. Volunteers of all ages are very actively involved in helping us run our services, and as such we recognise the important contribution that volunteers make in helping us achieve our aims. We are committed to providing exciting opportunities, regular and on-going support, training and social opportunities to enable volunteers to develop their skills, enhance their volunteering experiences and help them contribute to the wider community and progress to positive destinations. 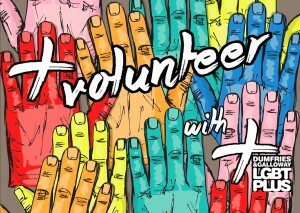 There are lots of ways you can volunteer your time to help D&G LGBT Plus, either on a regular or occasional basis. Everyone is welcome and we are particularly keen to hear from everyone over 18 who has an interest in supporting equality and diversity in your local community.